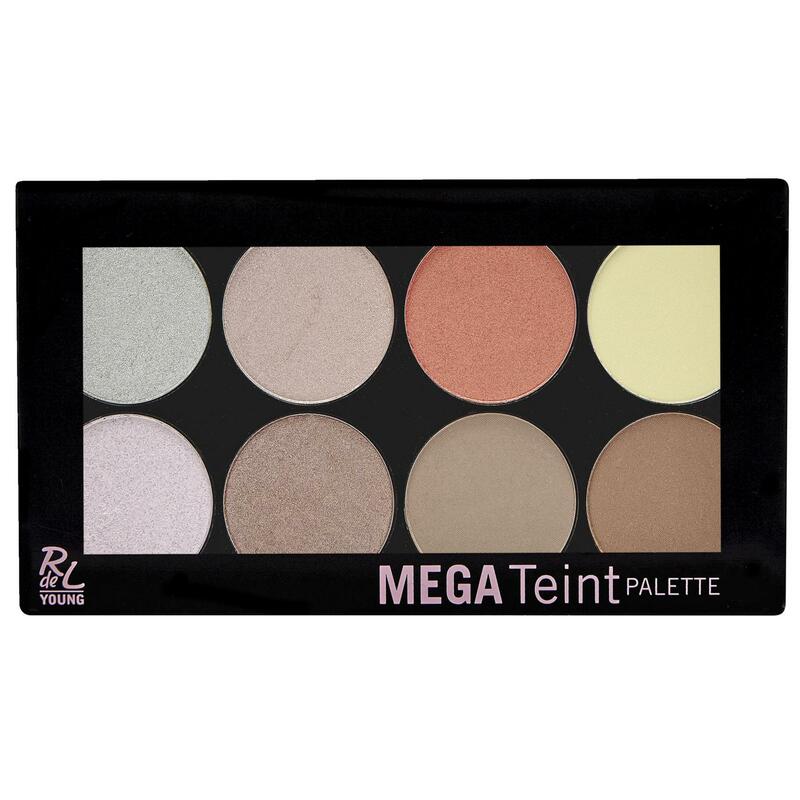 Die Mega Teint Palette mit 8 Farben ist ein echter Allrounder. Von Highlighter, Blush bis hin zum Contouring Powder - in der Mega Teint Palette sind alle Puderfarben für das professionele Highlighten und Betonen der Gesichtsform enthalten. 1 Ingredients: Talc, Mica, Synthetic Fluorphlogopite, Ethylhexyl Stearate, Bis-Diglyceryl Polyacyladipate-1, Caprylic/Capric Triglyceride, Magnesium Stearate, Caprylyl Glycol, Phenoxyethanol, Hexylene Glycol, Tocopheryl Acetate, Tin Oxide, Hydrolyzed Collagen, Hydrolyzed Silk, Maltodextrin, CI 77891, CI 77510. 2 Ingredients: Talc, Mica, Ethylhexyl Stearate, Magnesium Stearate, Bis-Diglyceryl Polyacyladipate-1, Caprylic/Capric Triglyceride, Caprylyl Glycol, Phenoxyethanol, Hexylene Glycol, Tocopheryl Acetate, Tin Oxide, Hydrolyzed Collagen, Hydrolyzed Silk, Maltodextrin, CI 77891, CI 77491, CI 77163, CI 77492. 3 Ingredients: Mica, Talc, Magnesium Stearate, Bis-Diglyceryl Polyacyladipate-1, Caprylic/Capric Triglyceride, Ethylhexyl Stearate, Caprylyl Glycol, Diethylhexyl Syringylidenemalonate, Phenoxyethanol, Hexylene Glycol, Tin Oxide, Tocopheryl Acetate, Hydrolyzed Collagen, Hydrolyzed Silk, Maltodextrin, CI 77891, CI 77491, CI 15850, CI 45410. 4 Ingredients: Talc, Mica, Magnesium Stearate, Bis-Diglyceryl Polyacyladipate-1, Caprylic/Capric Triglyceride, Ethylhexyl Stearate, Diethylhexyl Syringylidenemalonate, Caprylyl Glycol, Phenoxyethanol, Triglyceride, Hexylene Glycol, Theobroma Cacao Extract, Tocopheryl Acetate, Tocopherol, Parfum, Benzyl Alcohol, Anise Alcohol, Benzyl Benzoate, Eugenol, Hexyl Cinnamal, CI 77163, CI 77492, CI 16035. 5 Ingredients: Talc, Synthetic Fluorphlogopite, Mica, Bis-Diglyceryl, Polyacyladipate-1, Ethylhexyl Stearate, Caprylic/Capric Triglyceride, Magnesium Stearate, Caprylyl Glycol, Phenoxyethanol, Hexylene Glycol, Parfum, Tin Oxide, Tocopheryl Acetate, Hydrolyzed Collagen, Hydrolyzed Silk, Maltodextrin, Limonene, Citronellol, CI 77891, CI 15850, CI 77499. 6 Ingredients: Talc, Mica, Bis-Diglyceryl Polyacyladipate-1, Ethylhexyl Stearate, Caprylic/Capric Triglyceride, Magnesium Stearate, Caprylyl Glycol, Phenoxyethanol, Hexylene Glycol, Tocopheryl Acetate, Tin Oxide, Hydrolyzed Collagen, Hydrolyzed Silk, Maltodextrin, CI 77491, CI 77891. 7 Ingredients: Talc, Mica, Aluminum Starch, Octenylsuccinate, Silica, Zinc Stearate, Bis-Diglyceryl Polyacyladipate-1, Ethylhexyl Stearate, Caprylic/Capric Triglyceride, Aqua, Caprylyl Glycol, Parfum, Phenoxyethanol, Hexylene Glycol, Tocopheryl Acetate, Limonene, Citronellol, CI 77891, CI 77492, CI 77491, CI 16035. 8 Ingredients: Talc, Mica, Zinc Stearate, Silica, Bis-Diglyceryl Polyacyladipate-1, Ethylhexyl Stearate, Caprylic/Capric Triglyceride, Caprylyl Glycol, Parfum, Phenoxyethanol, Hexylene Glycol, Tocopheryl Acetate, Citronellol, Limonene, CI 77499, CI 77492, CI 7749.